African Union (AU) member-states held their 27th Ordinary Assembly of Heads-of-State in Kigali, Rwanda on July 17-18 where historic decisions on the launching of a continental passport and trade zone took center stage marking a stark contrast to recent developments in Europe. The gathering was characterized by optimism in regard to the future of the African continent with a special emphasis on unity, self-sufficiency and conflict resolution. Deby emphasized that the AU Summit was held under the theme “African Year on Human Rights with a particular focus on the Rights of Women”. He said the Summit dealt with important issues with the foresight to exchange views and perspectives on adopting viable solutions for the continent. Host President Paul Kgame of Rwanda spoke to the need for African unity and the role of a united continent in world affairs. He pointed out that a cohesive African policy would enhance the standing of the AU within the international community. The president then went on emphasizing “We will also address urgent threats to peace and security and elect new leadership for our organization. Good ideas were discussed on financing the African Union. We should be the ones to pay for activities in which everyone has a stake. This puts responsibility and ownership in our hands and we are capable of it and we were shown how to do so and I urge us to move forward with the required political will without delay. We need to start doing things differently and better. If Africa’s challenges are treated as routine it means we have accepted to be held back by them forever. We must all reject that future. An important change in the decision to organize the summit in a way that allows Africa to concentrate on its priorities with fewer distractions in the corridors and lobby’s leads us to thank the chairperson of the AU-Summit, President Idriss Deby and the chairperson of the Commission Dr. Nkosazana Dlamini-Zuma for the business-like manner in with which they have managed this process from the beginning,” Kagame added. In her opening address, H.E. Dr. Nkosazana Dlamini-Zuma, the African Union Commission Chairperson, expressed gratitude to the government and people of Rwanda for their outstanding organization of the gathering and its hospitality. 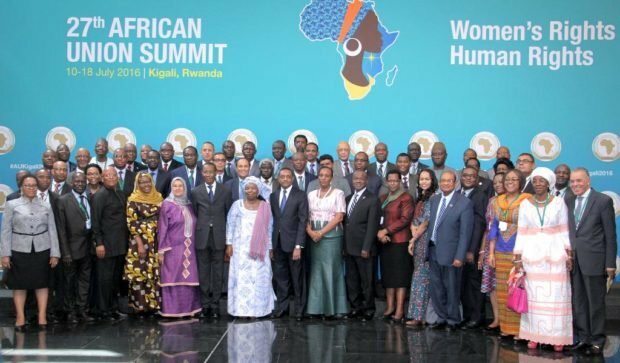 Dlamini-Zuma commended President Paul Kagame for leading by example in the field of gender equality and political empowerment in recognizing women as the center of national development inside the Central and East African country. Rwanda leads the African continent and other areas of the world with the majority of its legislature (64 percent) consisting of women parliamentarians. On a broader continental level the AUC Chairperson reviewed the programs implemented by the Commission over the last four years under her leadership which included the adoption of Agenda 2063. This plan grew out of the commemoration on May 25, 2013 of the 50th anniversary of the Organization of African Unity (OAU), the predecessor of the AU. The thrust of the report was designed to establish a policy framework leading to the achievement of a continent that is structurally integrated, politically peaceful and economically prosperous– guided by its own citizens determined to play a dynamic role in world affairs. Dlamini-Zuma reported that Africa is full of promise, potentialities and positivity as it relates to contemporary times and the future. Nonetheless, the current situation is also full of anguish in many areas, where African people are in desperate need of peace and stability in order to rebuild communities and societies. Fighting erupted once again earlier in July between two rival factions of the government in Juba which has created concern over the reconciliation process between Republic of South Sudan President Salva Kiir and Vice-President Reik Machar. South Sudan is the world’s youngest nation having gained its independence in 2011 in the aftermath of the partitioning of the Africa’s largest nation-state of Sudan. Now the Republic of Sudan in the North and the Republic of South Sudan in Juba are ruled as separate states. Dlamini Zuma also said that the Commission stands prepared to hand over the leadership due to an optimistic view for the continent. She noted the satisfaction felt towards the missions achieved during her tenure. Although Dlamini-Zuma was scheduled to handover the AUC to another chairperson, the Summit failed to achieve consensus on a new leader and she will remain in this position until the next meeting scheduled for early 2017. ‘‘The Heads of State have asked us to carry on our duties till the next elections in Jan 2017. We’ll just do that,” Dlamini-Zuma confirmed during remarks at the closing ceremony. Another major development during the course of the 27th Ordinary Session was the appeal by the Kingdom of Morocco to rejoin the AU. The northwest African state left the organization in 1984 when it was still known as the OAU over the recognition by the continental body of the Sahrawi Arab Democratic Republic (SADR) headed by the Polisario Front (PF), the liberation movement demanding full independence for the former colony of the so-called Spanish Sahara. Morocco has claimed sovereignty over the area rich in phosphates. An armed struggle by the PF was waged for many years. The United Nations has mandated that internationally-supervised elections by held to determine the future of the Western Sahara. Yet Morocco has refused to abide by the UN resolutions which are supported by the AU. Being the only African country not a member of the continental body, Moroccan King Mohammed VI made the appeal for readmission through a message to the summit in Rwanda this year saying it was time for Morocco to rejoin its family. The Western Sahara is claimed by Morocco as its “southern province” despite the years-long struggle for national independence supported by progressive forces throughout the world. Nonetheless, the AU said it will continue advocating for the full rights of the people in Western Sahara with the objective of holding a referendum on the self-determination and independence of the territory.